As parents Alon and Michelle picked up some of the healthier but still tasty food options, 9-year-old Kobi went for gum and candies. (I think he had an idea what the soldiers would really want, though Alon was probably not far off in wanting to bring them a beer. Of course, he wisely realized that they probably weren’t allowed that while on duty.) Liat (11) may have been the smartest of all, when she suggested we get them some deodorant! I okayed that, having heard that (at least early in the war)there was a need for toiletries and underwear and the like. Then we drove a short way to make our visit. 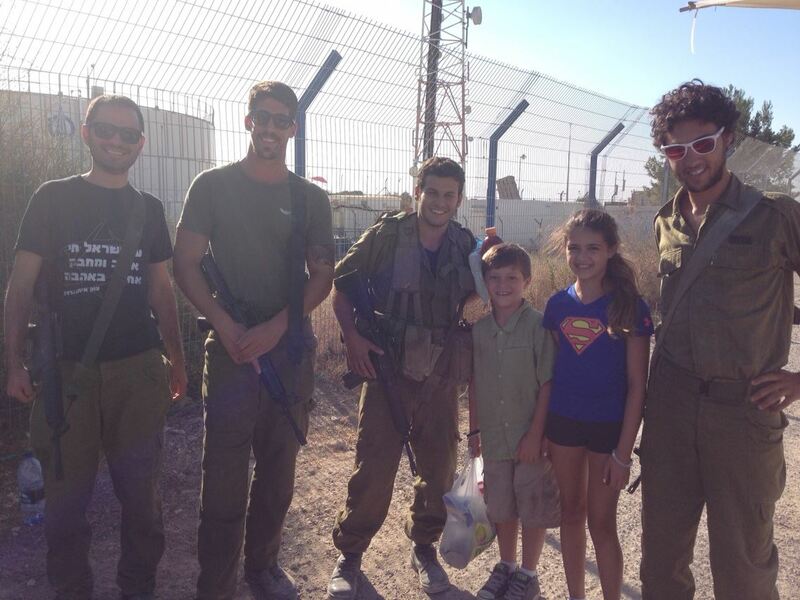 The soldiers who we met were super happy and thankful to meet with us, particularly the kids. Kobi and Liat got to try on one of the soldier’s helmets. They spoke to us all (in English and Hebrew) about where they come from, what they do, how the Iron Dome works and many other things. And when the officer on duty walked past, having just finished a shower, he was particularly thankful for Liat’s deodorant purchase! All in all, we spent a short visit there — just about 20 minutes. But that short visit created a memory that will stay with the Frumers (and me) for years to come. And I’m certain the soldiers felt the same way. What an honor to help this family say thanks to those who protect us in times of need! If you’d like to thank the members of the IDF during a visit to Israel, let me know! There are many options for both more and less formal activities, all of which are appropriate and appreciated.